Romualdo de Souza received an A.B. degree in Chemistry from Washington University in St. Louis in 1983. His interest in the field of nuclear chemistry stems from these early days and his undergraduate research experience. These unremarkable beginnings led him to pursue the field of nuclear chemistry in his graduate studies at the University of Rochester. He completed a Ph.D at the University of Rochester in 1988. For his postdoctoral studies he was designated a Research Fellow at the National Superconducting Cyclotron Laboratory (NSCL), Michigan State University (1988-1991). 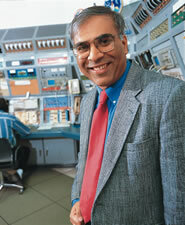 While at NSCL he constructed a novel 4p detector system for the investigation of nuclear multifragmentation. He joined the faculty at Indiana University as an assistant professor in 1991. Prof. deSouza has diverse research interests ranging from the nuclear equation of state to understanding the process by which elements are formed in supernova explosions. He is a prolific instrument builder and has constructed several novel detector arrays together with their associated electronics. Using fragment-fragment correlation techniques his group has probed the decay of excited nuclear systems on the time scale of 10-22 sec. Recently, these investigations have been extended to the resonance spectroscopy of short-lived unbound nuclei and the phenomenon of proximity decay. In 1994 he was designated an A.P. Sloan Fellow and subsequently a Gill Fellow. Prof. de Souza’s accomplishments in the teaching arena have been honored by designating him a an SBC/Ameritech Fellow (2002-2003) and awarding him the IU President’s Award (1998). In 2008 for his contributions to the field of nuclear chemistry he was awarded the Glenn T. Seaborg award by the American Chemical Society.